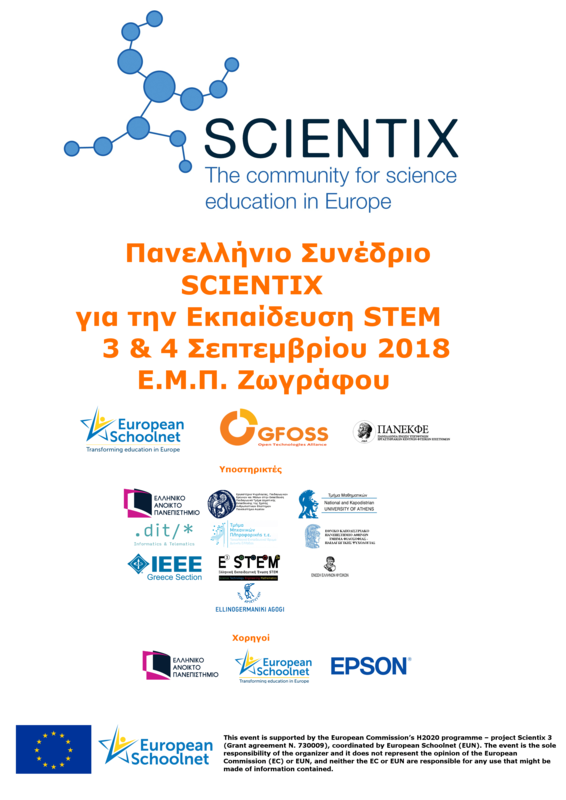 The Greek Scientix Conference for STEM training was successfully completed, the conference was organized by the Open Technologies Alliance(GFOSS), the National Association of Managers of the Natural Science Laboratories (panekfe) and the European SchoolNet on 3-4 September 2018 at the National Technical University of Athens, in the Zografou campus. In the conference 857 participants registered online, lectures and workshops were attended by more than 500 Primary and Secondary Teachers, researchers and students. The Conference was opened by the President of the Open Technologies Alliance(GFOSS), Professor Diomidis Spinellis, the Dean of the School of Electrical and Computer Engineering of the National Technical University of Athens Professor Nektarios Koziris, Georgella Fermeli, Coordinator of the Physical Sciences Unit and a member of the The Board of Directors of the Institute for Educational Policy, the President of PANEKFE Evgenia Tsitopoulou – Christodoulides, and Athanasios Falkoukas, Director of Secondary Education of Athens. – Utilization of innovative educational practices from STEM in teaching Primary and Secondary Education. – Free Software and Innovative Educational Practices from Science, Technology, Mathematics and Information Technology Education. All presentations are available at https://scientix.ellak.gr/parousiasis/. Scientix (scientix.eu) was originally an initiative of the European Commission and has, since its inception, been coordinated by European Schoolnet (eun.org). 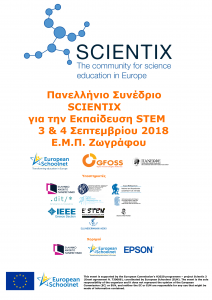 Scientix promotes and supports a Europe-wide collaboration among STEM (science, technology, engineering and maths) teachers, education researchers, policymakers and other STEM education professionals. In Greece, Scientix is coordinated by Open Technologies Alliance(GFOSS). The Scientix Conference was also sponsored by the Hellenic Open University, the National Technical University of Athens and EPSON Hellas.